Ralph M. "Bob" Albano, 84, of 22 Lincoln Ave., Seneca Falls, died Saturday at home. Born in New York City, he lived in Port Byron before moving to Seneca Falls. He retired after 32 years as a heavy-equipment operator for the Seneca Army Depot, Romulus. He was a prizefighter in the 1930s and 1940s and was inducted into the Auburn Old Timer Boxers Hall of Fame in 1975. He worked for the Civil Conservation Corps and was a World War II veteran. A son, John Joseph, died in 1962. Survivors: His wife, the former Madeline Nozzolio; a sister, Tillie Watkins of Jordan; a brother, Frank of Oakland, Fla.
Services: 10 a.m. Wednesday in St. Patrick's Church. Burial, St. Columbkille Cemetery. Calling hours, 2 to 7 p.m. Tuesday at Doran Funeral Home, 4 E. Bayard St., Seneca Falls. Contributions: St. Patrick's Church, 97 E. Bayard St., Seneca Falls 13148. 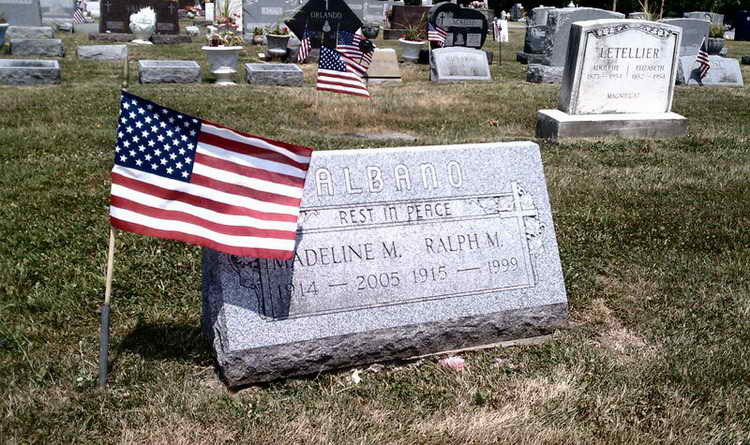 Grave markers for Ralph M. Albamo in the Saint Columbkille Cemetery, Seneca Falls (Seneca County, New York.